Spanning seven decks and 17,5 meters, the screen will give the Hurtigruten guests a truly unique welcome when they step on board MS Roald Amundsen – the world’s first hybrid powered cruise ship. “Our focus on state-of-the-art design, innovation and technology is not limited to the exterior. It also includes the interior and will take the guest experience to a whole new level. 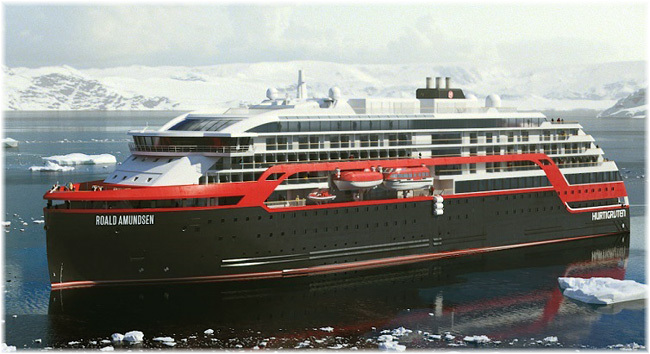 By introducing the tallest LED-screen at sea, we will bring – and magnify – the splendid beauty of the passing nature, to the guests inside”, Hurtigruten CEO Daniel Skjeldam says. The stunning scenery will be reflected in a modern Scandinavian design – with features spanning from the high-tech Amundsen Science Center, vast observation decks, an infinity pool, panoramic sauna, wellness center, three restaurants, bars, Explorer Lounge, aft-facing suites with private outdoor hot tubs, and the laidback atmosphere that creates the special Hurtigruten on board feel. The screen will be located in MS Roald Amundsen’s atrium. Facing the three all-glass elevators, it towers all the way up to and including deck 10. Featuring cutting edge LED technology, the screen will provide a resolution beyond 4K Ultra-HD, with perfect seamless and borderless display.